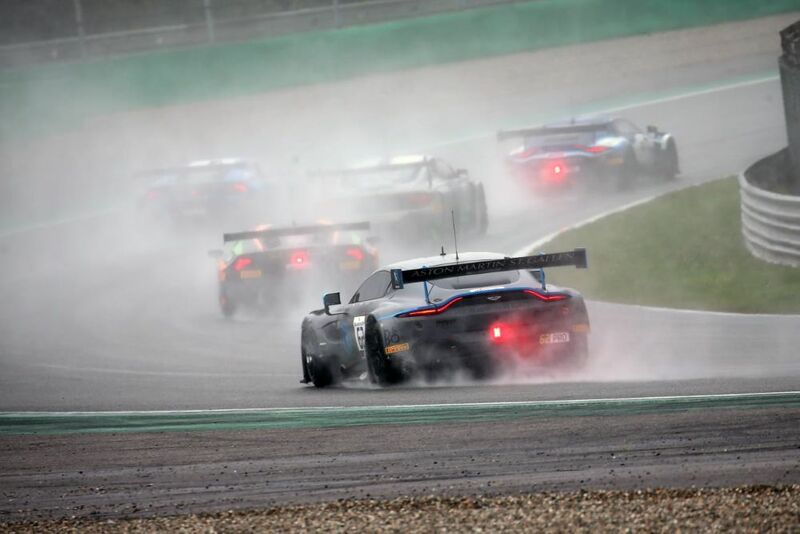 Matt Parry’s first race for R-Motorsport in the Blancpain GT Series Endurance Cup proved to be something of a washout as heavy rain affected the opening round of the 2019 championship at Monza in Italy. The Welsh speedster was embarking on his third season in the Blancpain series, but making only his second outing with his new team, having first appeared in its instantly-identifiable grey-and-blue Aston Martin at the Bathurst 12 Hours. Since being confirmed for the whole of the Blancpain GT Series Endurance Cup in February, Parry had already amassed many miles of testing in the all-new #62 Vantage GT3, and headed to Italy confident that it could be a contender. Unfortunately for the entire field, the weekend was caught up in the storms sweeping across the north of the country, depositing heavy rain over Monza’s royal park on all three days of competition. Although the #62 Aston Martin felt reasonable in both wet and dry conditions, it was apparent from the start of the event that the balance of performance (BoP) tweaks applied by series organiser SRO would be a hindrance at the fastest circuit on the calendar, with Parry and co-drivers Matthieu Vaxiviere and Maxime Martin all reporting that the car was struggling for bottom-end torque on the exit of corners, penalising it in terms of lap time and leaving it in the lower reaches of the top 20 throughout practice. Matt Parry will be looking for a better result at Silverstone. It was much the same story in qualifying, with rain affecting the entire session, but the three-man crew recording consistent laps in the #62. Vaxiviere and Parry again posted lap good enough to keep the car comfortably inside the top 20, while the experienced Martin did enough in the third and final qualifying phase to boost the trio’s average time and put them eleventh on the grid, eight places ahead of the sister R-Motorsport entry. “What we achieved in qualifying probably exceeded the team’s expectations,” Cardiff-born Parry admitted, “Practice had been a little hit-and-miss, with the track starting wet and gradually drying though the day, and it was clear from the start that, while the car felt sound in all conditions, the BoP was not working in our favour at this track. Starting from the inside of row six allowed the crew of the #62 to focus on chasing points from the start of Sunday’s three-hour race and, despite having to cope with low tyre temperatures early on, the car remained on the fringes of the top ten when the Frenchman handed over to Parry at the end of the opening hour. The 25-year old Welshman then enjoyed perhaps the best conditions of the race, but found that his tyre pressures were not ideal for the drying track and, struggling for grip, he concentrated on maintaining consistent lap times in order to remain in contention. With the rain abating, and little to lose in their pursuit of points, R-Motorsport decided that it was worth switching the #62 onto slicks during Parry’s run, but the gamble – which could have seen the former McLaren Autosport BRDC Young Driver of the Year move up through the field – was thwarted when rain returned at the far end of the circuit, making the two Lesmo corners particularly tricky. With safety car interruptions also slowing the pace, maintaining tyre temperature was a problem for the entire field, but Parry kept the Aston Martin out of harm’s way before handing over to Martin for the run to the flag. Misfortune continued to dog R-Motorsport, however, as the driver change was delayed by another competitor overshooting his pit box and blocking Parry’s entry, costing the #62 more than a minute, sending it plummeting down the order and negating all the diligent driving that had marked the opening two hours. When Martin then suffered a puncture, there was no chance of recovering lost positions, leaving the crew a frustrated 37th at the chequered flag. “It just wasn’t meant to be our day,” Parry sighed, “The weather made it difficult for everyone out there, but Matthieu and I did what we could to keep the car in contention for points. Unfortunately, things conspired against us in the final hour, with the delay in the pits and then the puncture meaning that Maxime was unable to chase a top ten finish. Round two of the 2019 Blancpain GT Championship Endurance Cup takes place at Parry’s home circuit, Silverstone, over the weekend of 11-12 May.